SEASIDE, Calif. -- It was once home to Clint Eastwood and Ken Venturi -- both with shaved heads. Today's Bayonet and Black Horse Golf Courses were once part of the U.S. Army's Fort Ord, home to 25,000 soldiers, and where Eastwood and Venturi attended basic training. The 476-yard, par 4 ninth hole at Bayonet Golf Course plays almost entirely uphill. 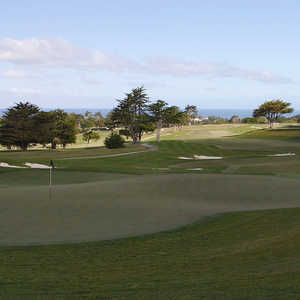 For a variety of reasons, some of which include the challenging layouts and stunning views over the Monterey Peninsula, the Bayonet and Black Horse Golf Courses have hosted to numerous PGA legends such as Arnold Palmer and Jack Nicklaus as well as several U.S. Presidents and foreign dignitaries. More than 50 years ago it was on this land that General Bob McClure, a left-handed golfer with a famous slice, constructed Bayonet Golf Course in 1954 and attracted PGA Tour pros of the era -- their photos grace the clubhouse walls. Jack Nicklaus and Arnold Palmer also played here as well as Tom Watson. Many other pros have followed, some for practice rounds before the AT&T Pebble Beach Pro-Am, and after a round in 1997, PGA Tour pro Billy Andrade said, "If they played the U.S. Open here, the scores would be over par. It's tough, but it's fun." 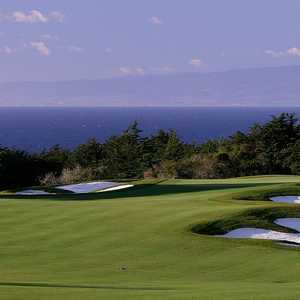 Greg Norman exclaimed that it was better than Cypress Point or Pebble Beach before the 2000 U.S. Open at Pebble. The media had a field day with that comment. In 1964 a second 18-hole championship course named Black Horse was opened claiming even more views of Monterey Bay, more elevation changes, tighter fairways and smaller, trickier bent and poa annua greens. But the distinction that makes the 36 holes as mean as they come are the tight, cypress-lined fairways. In the old days the trees' limbs went all the way to the ground, but when BSL Golf Corporation took over management for the City of Seaside in 1997, those tree limbs were trimmed upward. Still, this complex is a stern test of golf with a rich history. Bayonet Golf Course was named for the Army's seventh Infantry Division, the first major unit to occupy Fort Ord. It measures a daunting 7,110 yards long, par 72, with oak and cypress lined fairways, and a beguiling stretch of holes 11 through 15, named "Combat Corner" -- a series of sharp doglegs to the left, broken only by the straightaway uphill, 215-yard par-3 14th. The Black Horse Course was designed by General Edwin Carnes, the fort commander, as the sister course to Bayonet. It was named after the 11th Cavalry Regiment (nicknamed Black Horse) and stretches out to 7,009 yards at par 72. Both courses were said to be built by volunteer enlisted soldiers, who planted the more than 2,000 dastardly trees on a barren site. PGA Tour architect Chris Gray has tweaked the course over the past few years and there's a movement to put the complex under the PGA Tour properties umbrella in partnership with BSL. Gray didn't alter Bayonet's original design significantly -- he reshaped bunkers and repositioned tee boxes. The major change came in 1997 to the 12th, which was moved lessening the severity of a sharp dogleg left. Black Horse was updated in 1998 also by Gray and the PGA Tour, to put it into championship shape. The first and eighth fairways were rebuilt, along with tee boxes and bunkers. Yardage was stretched from 6,500 to 7,009 from the gold tees. 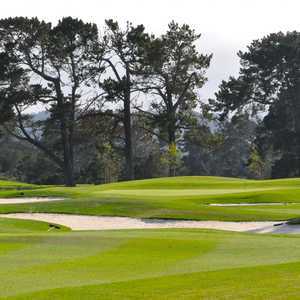 Bayonet has been used as the site of a 2002 U.S. Open local Qualifier; 2000-2001 Buy.Com Monterey Peninsula Classic (Nationwide Tour); 1998-2000 PGA TOUR Stage I and II qualifiers; 1992 U.S. Open local qualifier; 1990-1993 AT&T National Pro-AM; and is now home to a new 54-hole tournament on the Champions Tour called the First Tee Open. Joe Priddy, director of golf, says the Nationwide Tour players loved Bayonet, but that it served up the highest average scores on the schedule. Forty of the top 50 money-winners came to test the layout and see how they measured up. Bayonet and Black Horse challenge golfers with bowling-alley narrow fairways lined with unforgiving cypress trees. This complex is a must-play when you come to Monterey. Bring plenty of golf balls, your camera and enjoy. If you can't afford the golf where the rich folks play -- Pebble Beach, Spyglass Hill and Spanish Bay -- this is your chance to experience more affordable, but equally as scenic golf and smell the fragrance that is the Pacific Ocean just within sight.